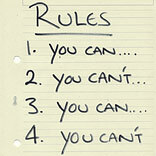 ‘Unwritten Ground Rules’ (UGRs) is something that occurs in all businesses. UGRs are people’s perceptions of ‘This is the way we do things around here’. An example will define things more clearly. Every Sunday, Farmer Market took place at town centre in UK. Before the market came to the town, every shop was closed on a Sunday morning, but when the market opened, the marketing committee encouraged local retailers to participate and open their doors. The market generated 3,000 consumers walking past the retailer’s door in a four hour period and the market proved to be a huge benefit and much loved social hub for the local community. One day, when the markets opened, one local retailer who decided to open on a Sunday morning took offence and started complaining to the stall holders around her shop that they were affecting her sales. Each week we fixed the fault, she would come up with another problem. This went on for several months and finally one day the store owner swore at the stall holder and became abusive. The result was a stern letter from the marketing committee co-ordinator that, it was unacceptable behaviour. It is a classic case of UGRs and how they can affect a small business. The store manager had a gripe with the market, but in a small community the grapevine works exceptionally well. The news of the retailer’s attitude quickly spread through the community and now consumers are scared to walk into the shop in case they get berated as well. We often forget the importance of unwritten ground rules and how they can affect our businesses. Positive gestures that reflect on your business and ‘touch’ the customer can build business more quickly than you think; word of mouth is still a powerful means of getting your message across. Get your team together and let them know the framework in which they can interact with the customer. An example of this is John Lewis, the departmental retailer in the UK. When a customer’s bag broke, a staff took off his tie and used it as a handle for the customer’s shopping bags, this positive act of kindness has almost become a retail legend over the last few months. The reverse is also true, if a member of your team creates a negative situation in the eyes of the customer then news travels fast. They may feel relieved but to do this in a relationship with a customer, has dire results. It used to be that the customer would convey about their bad experience to other customers, and through social networking the message can spread widely in the same day. 2. Put a business alert on Google for your business name so that you can track what customers are saying about your business. This will also allow you to react quickly. 3. Create a Face Book page for the business so that customers can interact more easily with you. 4. Bite your tongue before you let loose in front of a customer, it is better to kick a wall than a customer. 6. Give the team the ground rules so they know what they can do to develop positive UGRs with the customer. 7. Make sure you are empowering the team to make the right decisions in front of the customer. 8. Listen to your team and to your customers.